Why is this technology unique? Due to the size of our drone we can fly the camera to such narrow places (close to buildings, trees, towers, even indoor) where no other flying craft can (neither helicopter nor aircraft). That is why our films are unique. Sight can move from a close portrait to birds view with no cut. We can control independently the flight of the drone and the gyroscope stabilized moves of the camera within a range of a 1500 meters horizontally and 400-meters vertically. We can fly our device very precisely. Due to many tests and calibrations the flight is very smooth. Our MoVI gimbal holds the camera perfectly stable in the air so our films are impressive. We can watch live HD quality picture during the flight on our monitors, so we can compose precisely, look for the best plans and turns. Our national champion RC pilot cares for the smooth flight, our experienced cameraman for the professional picture quality and the composition. The technological reliability, quality and developments are in the unerring hands of our mechanical and electrical engineers. Airfilm crew is a professionally highly trained, friendly group with whom it is really good to work together with! For aerial films we regularly use Canon 5D Mark IV cameras in full HD (1920×1080 pixels) resolution, but we can also carry ARRI Alexa Mini; RED Epic, RED Dragon; Canon 1 DC (4K) cameras upon request. The maximal weight of our drone is 25 kg so it gives more than enough power to lift and carry these bigger cameras. MoVi PRO or MoVi M15 gimbal does the camera stabilization – which is unique in Hungary. 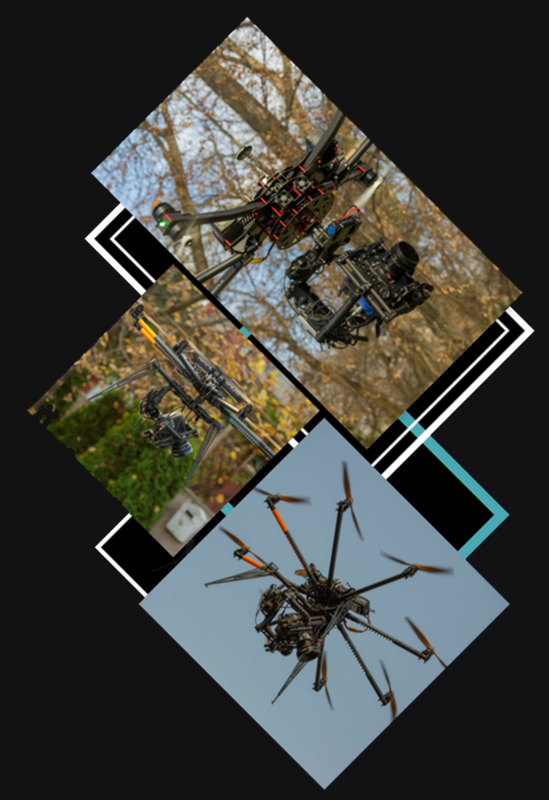 Our octocopter can take-off on a street or even inside a building. Our technology can replace the more expensive and difficult camera moving methods used in the industry, and – by braking its barriers – enables directors and cameramen to think and produce in a new, broader and more creative visual universe. Our operation is quick and flexible, we can get to the spot easily both in the cities and in the countryside. In case of off-city shootings it is a great advantage, that our drone can be delivered to the spot in a car, so logistics are far simpler and cheaper than in case of using real helicopters. We can take-off within 15-20 minutes upon arrival to the spot. One battery enables us to fly 10-12 minutes depending on the weight of the camera. The battery change takes 2 minutes. Having many batteries and an electricity aggregator, we can fly continuously without major charging stops. Inspections of bridges, power stations, windmills, etc.